Throughout the centuries ruby has always been highly regarded and as colored gemstones go, ruby is one of the most historically significant. In ancient Sanskrit ruby was named ratnaraj, or “king of precious stones”. The gemstone received its modern name from the Latin word ruber, which means red, and ruby will forever be the standard that all other red gemstones are compared against. Ruby has acquired its fair share of legends through the years, most involving beauty, wisdom, love or protection. The gem retained its regard as the western world grew, and it soon became one of the most sought after precious stones of European upper class and royalty. In modern times, the desire for ruby has only grown as it has become a symbol of love and passion. With these notions in mind, ruby would make a stunning and meaningful center stone in any of our custom created engagement rings. Ruby is the vibrant red variety of the mineral corundum. This mineral family also includes the gemstone sapphire, in all of its colors. In its purest form, corundum is colorless, but trace elements present in the crystal structure causes its wide variety of hues. Chromium is the trace element responsible of ruby’s red coloring. 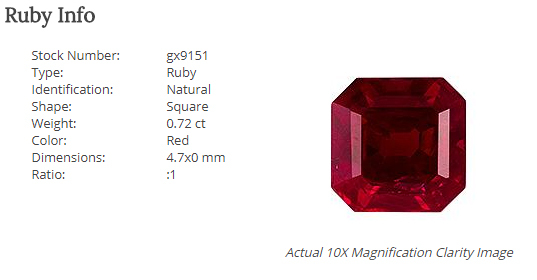 Ruby, and all other corundum, holds an average gemstone hardness of 9 on the Mohs Scale. It is not as durable as diamond, but ruby would fair very well in most custom engagement ring settings or any other custom creation you desire. The unique octagonal cut ruby shown here would make a stunning colored gemstone engagement ring or right hand ring. This deep red ruby option is currently featured on our online gemstone list, and is just waiting to be made into a custom created work of art! Let us at Knox Jewelers help you design a custom created piece of jewelry holding the scarlet octagonal ruby featured here or any other available option on our gemstone list. Contact us today to get started!